Klepierre is buying Corio, a weaker Dutch rival, for 7.2 bln euros including debt. That’s a reasonable price and will turn the French group into Europe’s biggest dedicated mall owner. With retail giants and e-commerce making life harder for shopping centres, scale matters. 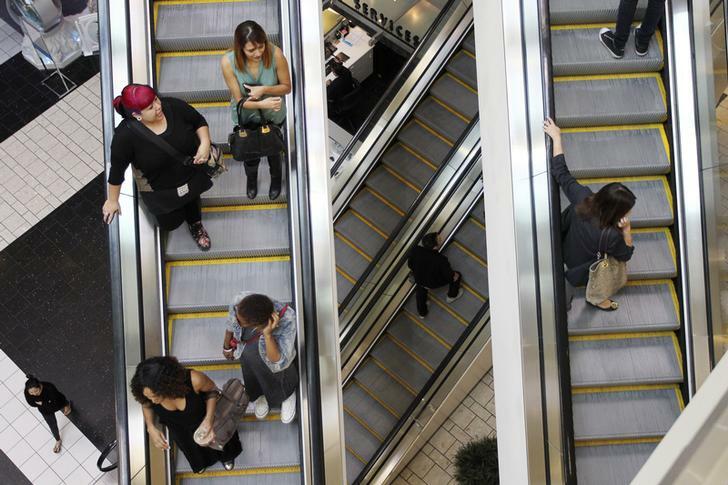 Shoppers ride escalators at the Beverly Center mall in Los Angeles, California November 8, 2013. Klepierre, the French real estate investment company, agreed to buy Dutch rival Corio for 7.2 billion euros including debt. In a statement on July 29, the two companies said the deal would create Europe’s “leading pure play retail property company,” with 21 billion euros of gross assets, and a market capitalisation of more than 10 billion euros. The friendly, all-share deal is supported by Klepierre’s largest shareholders, Simon Property Group of the United States, and BNP Paribas. It is also supported by Corio’s top investor, the Dutch pension fund manager APG, which has committed to tender its 30.6 percent stake. David Simon of Simon Property will remain chairman of Klepierre’s supervisory board. Corio shareholders will receive 1.14 shares in Klepierre for every share they hold. Based on July 28’s closing prices, that equates to a value of 41.4 euros per Corio share. The duo expect the deal to close in the first quarter of 2015. Corio shares rose 10.3 percent by 1455 GMT to 39.545 euros. Klepierre shares fell 2.9 percent to 35.295 euros.